The show airing June 11, 2018 – June 18, 2018 ‘highlights’ the Alzheimer’s Association WV Chapter. We interviewed Nikki Kinder, Special Events Coordinator and Allyson Carr, Volunteer from the Alzheimer’s Association. Nikki discussed their responsibility within our state. The Alzheimer’s Association, West Virginia Chapter is the only voluntary health organization in West Virginia solely dedicated to providing education and support service to individuals with Alzheimer’s and other dementias, to their families and caregivers. Their chapter serves all 55 counties in West Virginia and six counties in eastern Ohio. They exist to eliminate Alzheimer’s disease through the advancement of research; to provide and enhance care and support for all affected; and to reduce the risk of dementia through the promotion of brain health. We talked about research and advancements. Allyson talk about her beloved grandmother suffering from Alzheimer’s while her aging grandfather cared for her. Because of the toll caretakers undertake, the Alzheimer’s Association provides a lot of support. A place to discover you are not alone. A safe environment where confidentiality of shared information is respected. Support in understanding, coping with and managing Alzheimer’s disease. Help in locating and using community resources. Nikki and Allyson both talked about The Longest Day event(s) upcoming on June 21, 2018. The Longest Day is all about love. 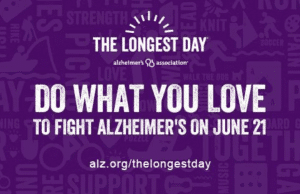 Love for all those affected by Alzheimer’s disease. On the summer solstice, team up with the Alzheimer’s Association and select any activity you love — or an activity loved by those affected — to help end Alzheimer’s all Together, let’s raise funds and awareness for care and support while advancing research toward the first survivor of Alzheimer’s. For Longest Day ideas click here. Click here to get started and form a team. Or call the WV Chapter at 800-272-3900.